Cost in hair transplant varies widely in different regions, and different people will be quoted different costs even in Guwahati itself. You definitely want the best results for your transplant, and it may be confusing to understand why different costs have been quoted for the same person. Cost in hair transplant depends on three main factors – the degree of baldness of the patient, the expectation of the patient and the rates of the clinic. Besides this, there are a number of other factors which influence cost in hair transplant in Guwahati. Because of the wide variation in costs that are quoted to the patient, you need to understand the factors which influence the costs, and also the right questions to ask so that you get the best results for your money. Here the top 10 things you need to understand about cost in hair transplant in Guwahati, Assam and the North East. Degree of baldness is the most important deciding factor for cost. The more the baldness the higher will be the cost for you. A higher area of baldness means a greater area to cover and hence a larger number of grafts and more time, so cost also is more. Your expectations and desires: this can often be the most important factor deciding the cost of the procedure. How much you want to do is your own choice, and you can choose to go for a larger number of grafts or a lesser number as per the amount you have earmarked for spending on your transplant. After all not everyone may want to go for the largest possible transplant – you might want just enough to make yourself presentable. Lesser number of grafts than the optimum can still be used to cover the baldness very effectively, either by lowering the density of grafts given or by covering mainly the front portion of the bald area and creating a nice hairline. Hairline and the 'tuft' area of the scalp, the mid frontal portion, is the main area for creating a look of normal hair and it is sufficient to cover this area with nice density to make you look young again. The rate of grafts is the third most important factor in the cost of transplant. It is here that you have to be extra careful in your decision to make sure that you get the best results for your cost of transplant. A whole lot of factors decide what the rate per graft is for the particular clinic and you have to consider these factors very carefully. They are given in the following sections. The experience and qualification of the doctor is the main factor determining the rate per graft of the clinic. You should look carefully into whether your doctor is qualified for hair transplant and whether he has sufficient experience. You should also look into whether he is a member of the professional bodies for hair transplant and whether he is in touch with the latest technological advances. A highly qualified professional will naturally charge more than a less qualified person. Chain clinics will usually have roaming doctors whose qualifications are dubious at best and who disappear once the procedure is over. Dr. P. J. Mazumdar is the most qualified hair transplant specialist in the North East as he is the only Diplomate in Hair Transplant Surgery from the American Board of Hair Transplant Surgeons. He is also the most experienced as he started FUE Hair Transplant in Guwahati and the North East in 2012, and performs by far the highest number of FUE procedures per year in the North East. The stature and reputation of the clinic is also very important in deciding the rate per graft. A well established and reputed clinic will naturally have higher standards to maintain and this increases the cost. Downtown hospital is the largest private hospital in the North East and Arogyam Hair Transplant Clinic is the only clinic in the North East to be situated in a hospital. All other clinics in the North East operate from rented premises with their inherent disadvantages. Full safety and sterility is ensured as the procedure is done in the fully equipped Main OT of Downtown hospital. Graft vs Hair also determines the cost. 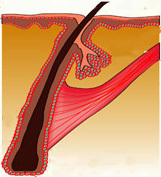 A graft consists of two to three hairs or more. Many clinics will confuse the patient by quoting prices for grafts whereas they mean hairs. Thus you may find a clinic offering you '5000 grafts in 1 day at just Rs 20 per graft'. This might seem attractive, but there are many pitfalls in this offer. First of all, it is impossible to do 5000 grafts in 1 day, internationally no doctor does more than 2500 to 3000 grafts in a day. This is a sure sign that the clinic means 5000 hairs, not grafts. Such large number of grafts quoted for a small area is a sure sign that they mean hairs, not grafts. Their price per graft would thus be around Rs 50, but by quoting hairs instead of grafts, they make it sound like Rs 20 only. Also, such clinics do not offer you any reasonable verification method so that you can never determine how much they have actually given. At Arogyam, strict ethical standards are maintained and all costs are quoted in grafts, which is the internationally accepted norm. Also, full verification is given to the patient by using counting trays in which the grafts are placed and then giving photos of these trays to the patients on their mobile, so that they can later zoom in and see whether grafts or hairs are being used and also count them easily on the counting trays. Thus no room is left for doubt in the mind of the patient. The level of instrumentation also determines the price. Highly sophisticated and advanced instruments are naturally more expensive and costs more. Hence prices would be more. At Arogyam, we use the most advanced technique, Blunt Motorised FUE, and the best instrumentation like 6X Heinz loupe, Choi Implanters, Blunt Titanium punch, density stamps, counting trays, etc to ensure the best results for the patient. Emergency services also increase the costs. Although hair transplant is an extremely safe procedure with a very low rate of complications, yet it is vital that full emergency infrastructure must be maintained for safety of the patient. Full Emergency services are possible only in a hospital setting and at Downtown hospital, we have the entire range of Emergency services to ensure full support in case of any emergency. Supporting infrastructure like pathology labs, blood banks, ICU etc are a must for any procedure. These also drive up the prices but are a necessary part of hair transplant. Downtown hospital has all the necessary infrastructure to support any big surgery including open heart surgery, kidney transplant, brain surgeries, etc and hence you will be assured of full support. Full documentation including GST taxes ensure that proper standards are maintained by the clinic and all legal and ethical standards are maintained. Downtown of course ensures that all such documentation is maintained up to the highest standards. Costs in Arogyam Hair Transplant Clinic are maintained according to the standards we provide. We are not the cheapest clinic in Guwahati or the North East, but we are not the most expensive either, our prices are in the middle range. But we can justifiably claim that we provide the best treatment according to all International ethical and technical standards and we do not compromise on quality. Our price is Rs 35 per graft plus GST. This is in the middle range of prices in India and also in Guwahati for any Association of Hair Restoration Surgery registered clinic and doctor. For a Grade 3 baldness, cost would be around Rs 30,000, for Grade 4 around Rs 40,000 to Rs 60,000 , Grade 5 between Rs 60,000 to Rs 80,000, Grade 6 Rs 1 lakh to Rs 1.2 lakh and Grade 7 more than Rs.1.5 lakhs. This is if they want to cover the whole scalp with high density, but as explained before you can also choose to do a lesser number of grafts and thus your cost can be lower than this also. Dr. Paul, Zoo Tiniali – part of a chain which started as a homeopathy clinic for hair. Monjoven, VIP Road – owned by Dr. Porag Neog, MS. First hair transplant in the North East was done in Monjoven using strip method in 2010. As you can see, we fall in the middle range of prices. Each clinic has its own strength and weaknesses. Different patients choose different clinics as per their priorities. As a prospective customer, you should examine each clinic and determine which would suit you best. We cannot offer the cheapest prices. Our surgeon is the most highly qualified and with the longest experience in FUE in the North East, our instrumentation is of the highest standards, our OT is fully equipped to handle everything, etc. Our prices are not the cheapest but also not the highest either. If you are looking for the cheapest clinic, then we are not it, but if you are looking for the best, then please go through our information. Dates may not be readily available. All our dates are generally already booked well in advance, so you should book 2-3 weeks in advance to get the date of your choice. We do not have a high profile advertisement campaign nor sponsored celebrities, hence you may have heard less of us in the media. Being hospital based in fact, there was no advertisement at all in the initial years and it is only now that some internet advertising is being done at a limited scope. Majority of our patients continue to be referral patients from previous satisfied customers. We do not offer highly glamorous facilities. Downtown hospital is one of the oldest hospitals in Guwahati, and the layout is not the most fashionable. The OT arrangement is geared towards sterility and efficiency rather than flamboyance. GST is a must. All our documentation is maintained legally and so we pay all our taxes. Dr. P. J. Mazumdar is the most highly qualified doctor in North East, as he is the only doctor in the region who is US Board Certified from the American Board of Hair Restoration Surgery as Diplomate in Hair Transplant, which is the highest recognition in Hair Transplant, and he is also the most experienced, having started FUE Hair Transplant in the North East in 2012 and doing the highest number of surgeries regularly since then. Arogyam Hair Transplant is situated in Downtown Hospital and all essential emergency services including full staff from anesthesilogists to emergency nursing care is available round the clock in case of any emergency.